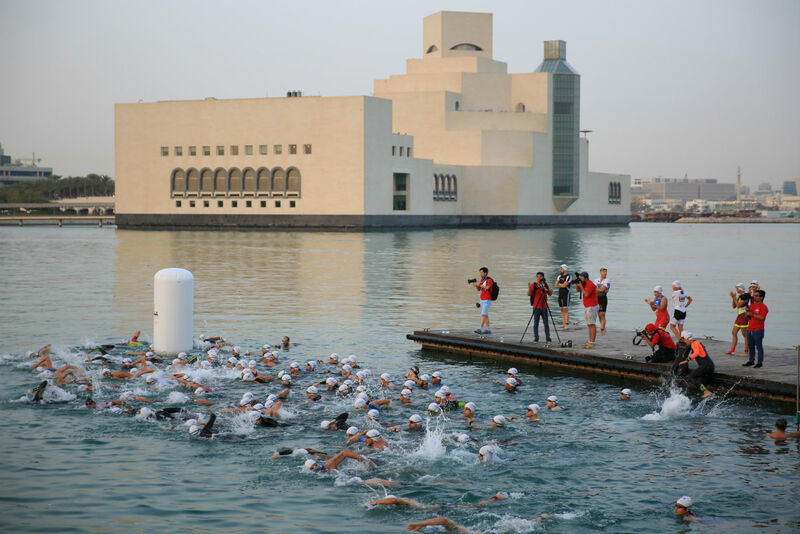 The third edition of Doha Triathlon is set to take place on Friday 8th February 2019, in the surrounding area of the Museum of Islamic Art (MIA), with the picturesque view of Doha’s skyline in the backdrop. A press conference was held on Sunday 3rd February 2019, in Movenpick Hotel to unveil all the details about the event. In attendance were Professor Nasser Al-Mohanadi, Qatar Triathlon Federation Vice President; Mr. Jamal Al-Kuwari, Qatar Triathlon Federation General Secretary, Mr. Thani Al Zaraa, Qatar Triathlon Federation Deputy General Secretary; Mr. Marouf Mahmoud, CEO, Tasama Sports Development and Mr. Nasser Al-Ansari, representative from Qatar National Tourism Council. The Federation is inviting Qatari nationals to join the Qatar National Championship event to form a stronger team and encouraging individuals to compete abroad. The Qatar National Championship is going to be the first race to start in the morning at 6:00 am with the Sprint distance – 750 m swim, 20 km cycling and 5 km run. It is a drafting race while all the other races are non-drafting. In addition to that, the event also includes Sprint, Olympic and Super Sprint distances as well as a Kids Fun Duathlon. As the races are going to take place in the premises of Corniche, one side of the Corniche road from the Museum of Islamic Art to Sheraton will be closed from 4:00 am to 10:30 am. Doha Triathlon is one of the biggest triathlon events attracting athletes from all over the world. This year, participants from Oman, Kuwait, France, Romania, Spain, US and UK and other countries will be attending the event. 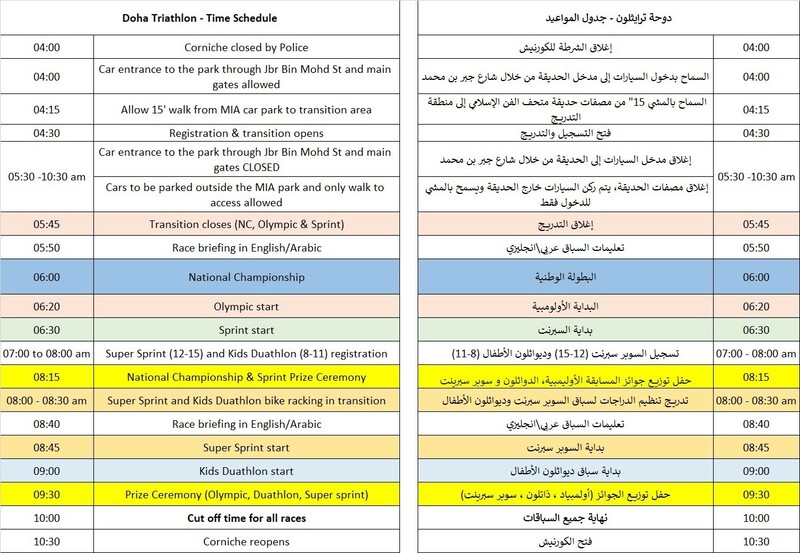 The third edition of Doha Triathlon is expecting more than 400 participants. Hence, the deadline for registration has been extended till midnight, February 5th. Doha Triathlon is part of the Qatar National Series scoreboard system for local athletes. The series includes five events located in five different areas: Katara, Al Ghariya, Doha, Losail and The Pearl-Qatar. The number of triathlon events has almost tripled since last year and triathlon is becoming a popular sport. Qatar Living is the exclusive media partner. Stay tuned to our social media for live updates throughout the event.